HD Multi-Screen Video Processor - MatrixStream Technologies, Inc.
MatrixStream e4090 hardware-based video processor is able to take digital or analog video feeds and convert them into IP video streams. Optimized for OTT IPTV streaming, the e4090 is able to deliver highest quality videos at the lowest bitrates. The hardware-based IMX e4090 video encoder is designed for total performance while delivering maximum value. Customer can save money by buying the standard definition version of the video encoder with the ability to upgrade to HD streaming at a future date. The IMX e4090 SD/HD video encoders are designed to deliver standard definition (480i/576i) and high definition 720p, 1080i and 1080p videos over IP even with bandwidth constraints utilizing MatrixStream’s MatrixCast streaming technology. The IMX e4090 series live video encoder is designed to work with IMX i2410 and IMX X1i live MatrixCast streaming servers to streaming live videos over a private IP network or the Internet. IMX e4090 video processor is optimized to stream highest quality videos at the lowest bitrates over the Internet. Audio Inputs – Embedded in SDI, HDMI. SPDIF and Analog stereo RCA. Low-profile 1U rack-mounted design for reduced cost-per-channel. The IMX e4090 SD/HD encoder is tuned up the newest H.264/AVC video up to 1080p resolution. Mpeg 4 AAC audio formats/AC3 is also supported. MatrixCast(R) video processing engine gives the highest picture quality available today at the lowest bitrate even during fast movement or night scenes. The IMX e4090hd also support advance features such as close caption*. Optimized for 500 Kbps for 480i/576i, 1.5 Mbps for HD 720p, 2.5 Mbps for HD 1080i and 3.5 Mbps for HD 1080p. IMX e4090 encodes live high definition H.264 video at resolutions of 480i, 576i, 720p, 1080i and 1080p. No noise low power consumption eco-green design. Embedded multi-chip SOC archecture for ultra high performance and reliablity. Supported frame rates 480i, 576i, HD 720p, HD 1080i and HD 1080p. Dual Gigabit Ethernet LAN ports provide additional performance and redundancy. 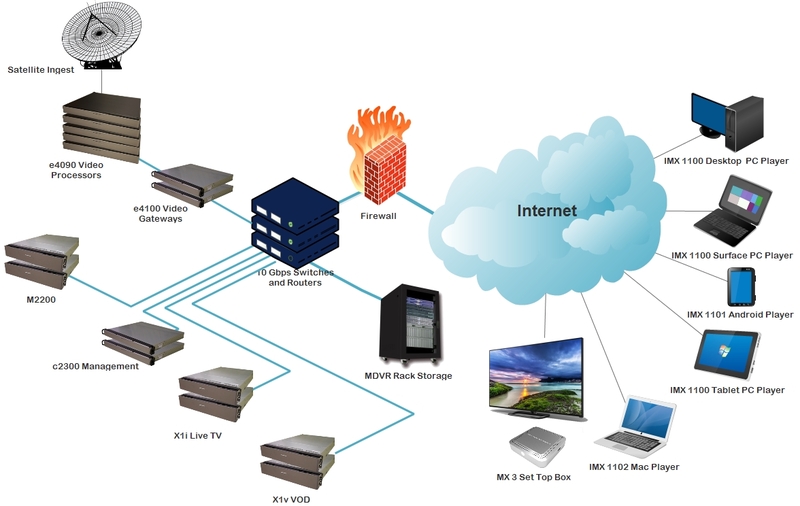 Seperate ethernet ports for service streaming and out-of-band management. Management by front panel with LCD/Keypad, embedded Web server configuration and SNMP (MIB v2C) with remote SNMP supervisor. Built-in MatrixCast Streaming encryption support using MatrixCrype DRM technology.